Hired by Giovanni Agnelli, structural engineer Giacomo Matt�-Trucco designed the Fiat automobile factory with Ford's assembly methods in mind. 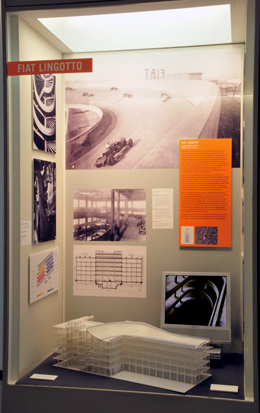 Production flowed from bottom to top, with finished cars arriving at the kilometer-long banked rooftop test track-- the building's most recognizable feature. Here, finished cars were tested, and then driven down to the street via spiral ramps with concrete structural ribs. 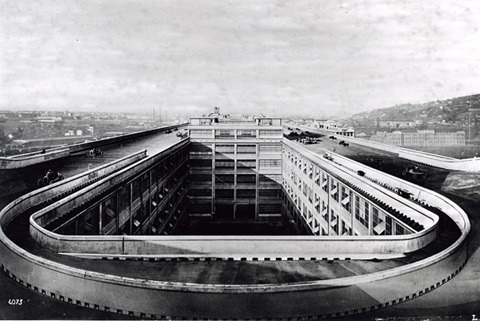 With 16 million sq ft of manufacturing space to accommodate 6,000 workers, Lingotto was unprecedented in size and scale. Le Corbusier featured the factory in his manifesto, Towards a New Architecture, solidifying its iconic status.